Saturday the 14th March saw the debut of thinkScience as part of the 2015 Auckland Arts Festival. As part of the day’s events, I organised a number of activities/installations involving a harmless marine bacterium that naturally glows in the dark. I got involved for many reasons, including putting science in places people weren’t expecting it, providing a space for the public to interact with scientists and also to show people that while they may be repulsed by the idea of bacteria and ‘germs’, these creatures can also be beautiful. 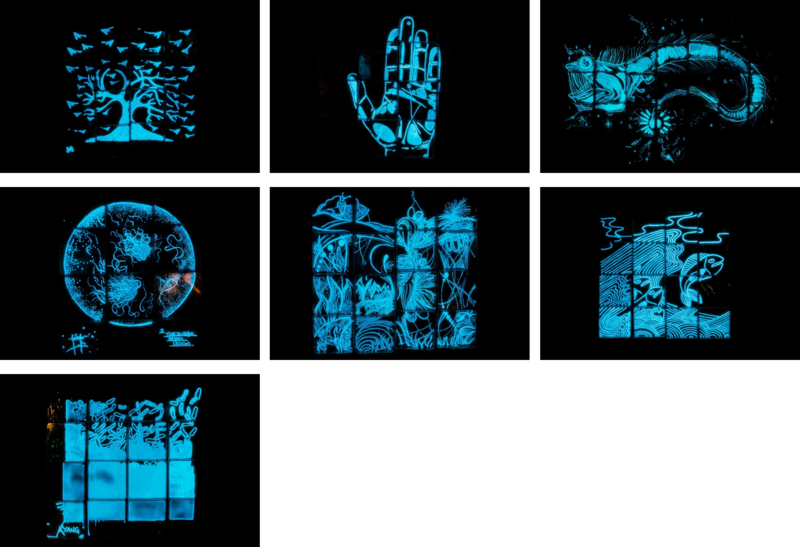 In Biolumination II, I acted as curator, challenging artists/illustrators Helen Beech, Julia Marchwicka, Cinzah ‘Seekayem’ Merkens, Hope Sutherland, Rodrigo Vidal, Laura Ward and Katherine Yang, to each come up with a work of art using just a solution of harmless bioluminescent bacteria and a collection of 25 x 25 cm square petri-dishes. To give you an idea of scale, most of the pieces were 1 metre high by 1 metre wide. That’s a lot of agar! Unfortunately for the artists, the bacterial solution is essentially invisible, and the artists weren’t able to see their creation until the bacteria had grown the next day. The works were displayed in the Vault, part of Q Theatre. The exhibit was open from 10:30am till midnight and was visited by over 1600 people. From left to right, top row: Helen Beech, Julia Marchwicka, Cinzah ‘Seekayem’ Merkens; middle row: Hope Sutherland, Rodrigo Vidal, Laura Ward; bottom row: Katherine Yang. Photographs by Benj Brooking. I’ll post better pictures and more info about each of the artists over the coming week. 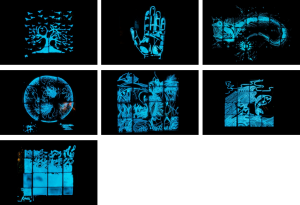 Overall, I am really pleased with how Biolumination II turned out. It was just amazing to see the beautiful creations each of the artists coaxed out of their bacterial solution. A huge thanks to my lab, most notably Benedict Uy, as well as James Dalton and Hannah Read, for preparing the litres and litres of media needed to make this exhibit a reality. Thanks also to Gareth Baston, chief petri-dish wrangler, for turning the Vault from a bare theatre space into an art gallery for the day. So what did the public think? 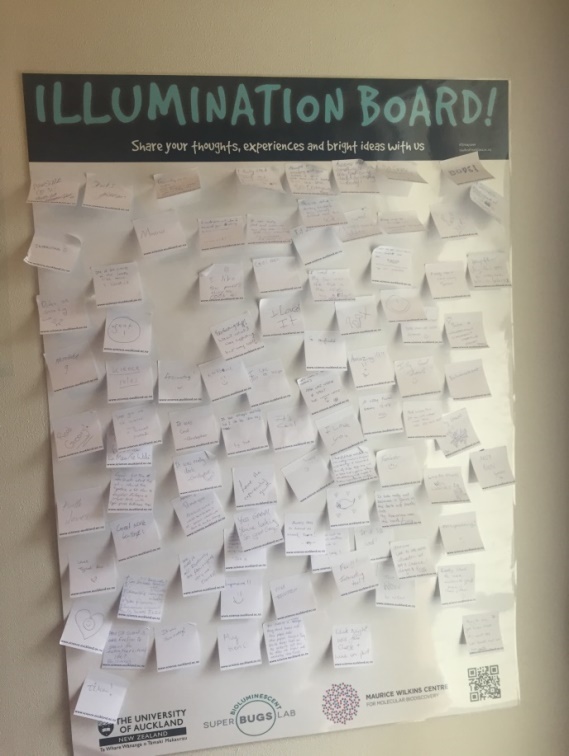 Dr Rhian Salmon, of Victoria University, Wellington, suggested using post-it notes to gather feedback from visitors to the exhibit. 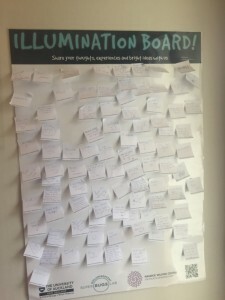 The ‘Illumination Board’ was born and 160 messages were left there throughout the day. These activities wouldn’t have happened with the financial and/or logistical help of everyone involved in thinkScience, the Auckland Arts Festival, the Ministry for Business, Innovation and Employment, the University of Auckland, the Maurice Wilkins Centre for Molecular Discovery, and Tile Space. And of course the never-ending patience of my lab!